Get the look of a high-end, designer kitchen at a fraction of the cost with matted Aspect. Manufactured from 60% recycled material, these easy to use, peel and stick matted Aspect sheets install easily while giving you the look of a custom backsplash. Matted Aspect is sold in packs of three sections covering 1 sq. ft.
Ribbed Putty 18-inch x 18-inch Carpet Tiles, Set of 16 (36 sq. ft. / case) The Traffic Master Carpet Tile is the best choice if you want a fashion forward look at a great price. Used as an area rug, hallway runner or wall to wall, this tile provides a solution that does not require an installer or a separate adhesive. You can create a new look in an afternoon with this peel & stick system. The 18"x18" tiles are cut with the "perfect cut" system, which ensures easy installation for a beautiful floor. The only tools you will need to install are a measuring tape, chalk line, utility knife with a sharp blade and a contractor square. The tiles have built in antimicrobial protection to fight the growth of stain and odour causing bacteria, as well as mould and mildew, which makes it perfect for kids or pets. Easily maintained by vacuuming or sweeping. In the event of a stubborn stain or damaged tile, simply replace the tile with a new one. Ribbed Putty 18-inch x 18-inch Carpet Tiles, Set of 16 (36 sq. ft. / case) is rated 3.8 out of 5 by 152. Rated 4 out of 5 by RozW from Easy to install and looks wonderful I ordered 3 different colours to install in a 100 year old rental property where the floors are quite uneven. I'm so very pleased with the result. See for yourself! Easy peasy to install with a good pair of scissors and a sharp exacto knife and a straight edge. The only reason I didn't give 5 stars is the putty colour (lightest one) seems thinner than the bark (darker neutral) and the black is the thickest. It works great in this application. I think with the 1/4 turn installation one colour would still look amazing. Rated 5 out of 5 by Jim from Good product for the price Excellent overall product. Don't expect it to be a plush carpet. Read the description and consider the price. Follow the installation instructions. I found cutting the tiles on a half sheet of quarter inch plywood greatly reduced dulling my cutting knife. BTW, I used a simple box cutter and a 24 inch T-square to cut the tiles. I used some spray contact glue on the tile backs where the tiles went around an edge and down the side of the patio. The only short coming I found was that some of the tiles seemed to be slightly out of square. Could be just my measuring and cutting. There is a softness when walking on the tiles as opposed to concrete. That is almost a luxurious feel! The project was well worth the effort. Rated 4 out of 5 by JackieM from Finished basement re-carpeting I purchased and installed these tiles when my husband and I updated our small finished basement. The tiles are extremely thin, as mentioned in the product description, but they have held up very well over the past 6 months and I'm expecting that they will last for quite sometime before any need to be replaced. The tiles were extremely easy to cut and arrange. The only complaint I have is that if you leave anything even remotely heavy on them (a portable dehumidifier, for example) it will leave an indent. This is to be expected, though, from a tile this thin, and the marks do go away with time. The carpet is lovely, though, considering the price - I would definitely buy these tiles again if I needed to! Rated 5 out of 5 by Kathy from Just what I hoped for Understanding that these carpet squares are so economically priced, i wasn't expecting much. They went down easily and were very forgiving in the corners and around door trim. They were easy to cut with a utility knife. They butted up against each other perfectly! I put them down over an old linoleum floor in our laundry room and adjoining hallway and closet. The adhesive on the back is fantastic! They really really stick. However, if while installing you need to lift one to re-position it, you can do that without damaging the square and it will still stick well after the repeated application. Yes, they are thin, but I expected that for the price. They are perfect for a laundry room, mud room, playroom, utility room. 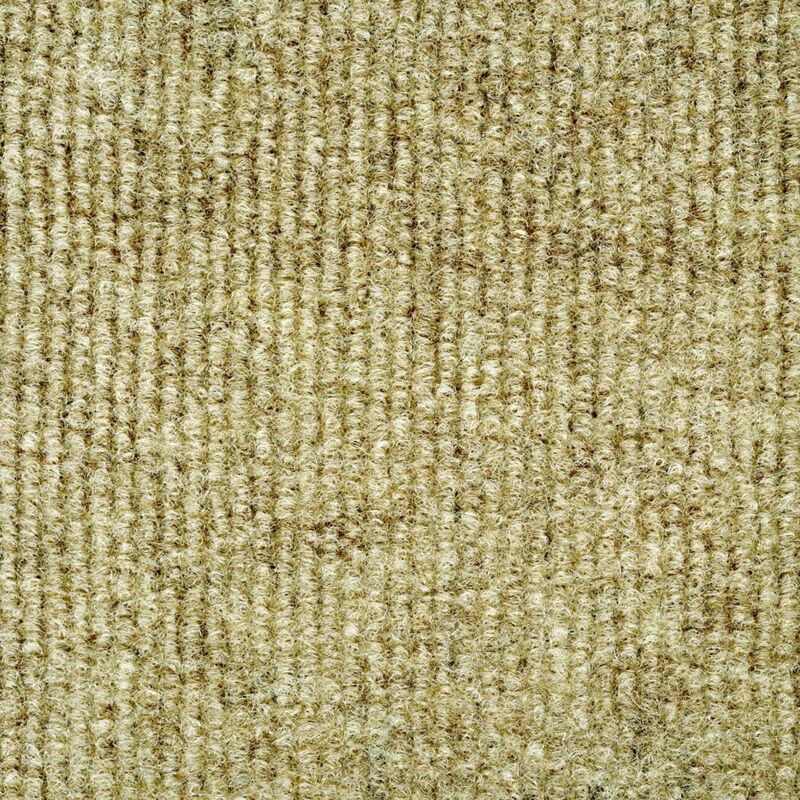 Rated 4 out of 5 by Anonymous from Traffic Master Carpet Tile. I used it in one of my spare bedrooms that had bare concrete floors. It installed quickly and easily. It fit my budget and looks pretty decent. I was impressed. I wouldn't use it in the living room but highly recommend it for the game room or a bedroom or office. Rated 1 out of 5 by Bobthebuilder from Think twice Not sure what the adhesive is designed to stick to, but appears useless. The tiles won't stay stuck.